On a sunny but cold November Sunday morning, more than 500 Santas took to the paths of a local park to raise money for St. Catherine’s Hospice, an organization that specializes in end-of-life care, providing resources, comfort and help to local people and their friends and families in their time of need – both during the holiday season and year-round. 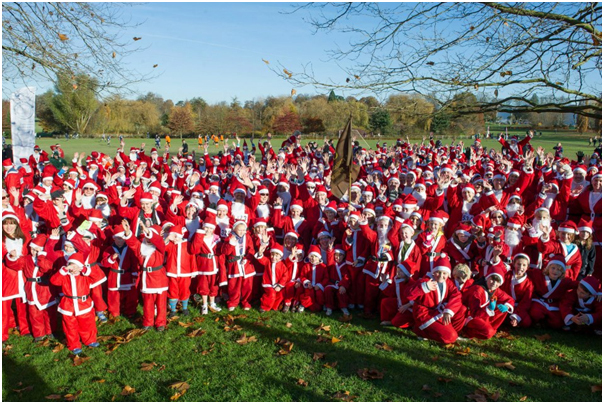 Among the “Santa” runners were employees, families and friends from the Jeppesen UK office in Crawley. The Santa Run was the culmination of year-long charity fundraising and support activities that the Jeppesen UK has been fully involved in. To date, they raised more than £350 from the Santa Run, adding to the £3900 ($6250) raised over the course of the year to support the very important work of this local hospice. This money has been raised in many ways, but wouldn’t be possible without the generosity, volunteerism and donations of so many people. In 2013, the UK team will continue to support St Catherine’s in hopes of raising even more money for the important services the hospice offers the Crawley community. In addition to St Catherine’s, the Jeppesen UK team also supports a local homeless organization, donating toiletries and food items to help those less fortunate in their community. Posted on December 11, 2012 in Community.